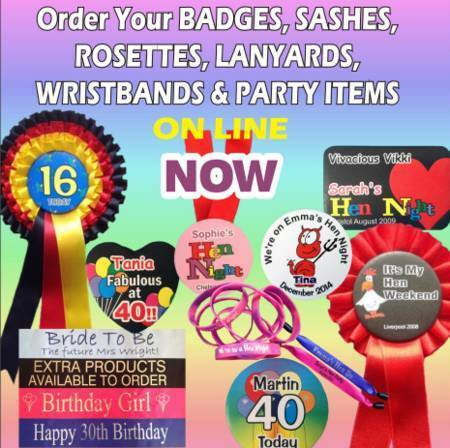 If you are having a party then it’s a great gesture to provide a little personalised gift for any youngsters that might be at the party – particularly applicable when you are looking at Birthdays for older siblings, Christenings and Weddings. So why not order some customised bibs. We can add wording like, “Thank you for coming to my Christening “or “thanks for coming to Uncle Barry and Auntie Glenda’s wedding” and also personalise it with the baby’s name. If it’s something that’s likely to continue into the evening then we also can personalise sleep suits! It’s an inexpensive gesture that will go down well with your guests. We can print in full colour – and even add a photograph – and best of all there is no minimum order. These days, everyone wants to look either different or wants to be seen wearing the latest designer clothing – so why not help the youngest member of the family to start early – combine the 2 ideas and design them their own piece of clothing. Whether it’s something very simple like a baby member or a baby grow, baby vest or T-shirt then it’s sure to be admired and welcomed as either an item of clothing or a gift. These kinds of gifts are perfect for new born babies, for work-leaving gifts for the expectant mothers, Christening gifts and for birthdays. Prices are very affordable, delivery is quick, and with our print process you don’t need to pay screen charges or order large volumes. We can print in full colour with a minimum order quantity of just one. If you want more information on our customised baby wear – baby bibs, baby grows, T shirts, sleep suits and vests then have a look at our web site or just give us a phone call with your requirements and we will be delighted to help.